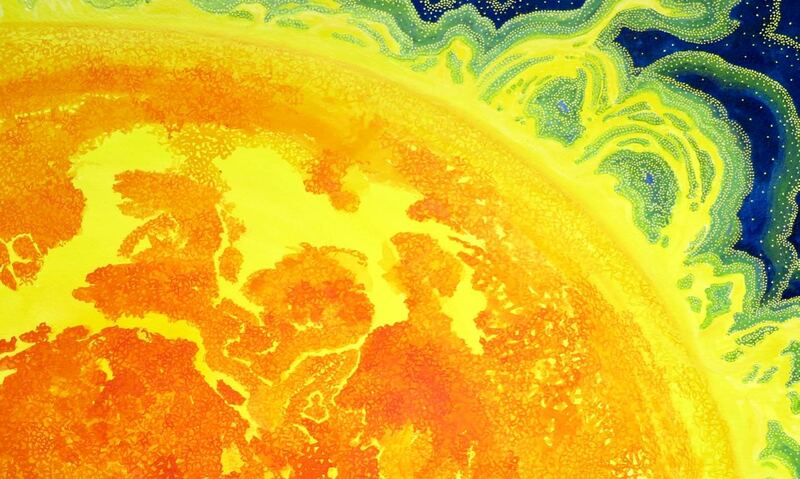 “This fourth in Chisholm and Bang’s series about the sun’s relationship to life on Earth explores its ancient stores of fossil fuels and the effect of intense and rapid consumption of these in recent human history. “The sun’s first-person voice puts readers at the center: “Yes, living things—including YOU—need energy to stay alive and grow.” The explanation begins with plants and moves concisely through photosynthesis and the use of the resulting carbon chains and animal production of carbon dioxide. Bang’s edge-to-edge art in rich blues and greens is stippled with color suggesting, variously, energy in sunlight, microscopic life and the release of carbon gases. Reds and yellows convey the heat of the sun as well as that of cities and deserts. This lively diagram of the relationships among plant and animal, sunlight, CO2 production and the Earth’s “blanket” of atmosphere is pitched to somewhat older readers than the earlier books. The result of the relatively sudden excess of CO2 on what was formerly an ebb and flow of warmth and cooling is direct. “ ‘SO WHAT?’ some people say. / SO THIS:” precedes the description of how and why more heat is trapped under the Earth’s blanket and what climate changes are now being seen. Abundant backmatter provides a more detailed explanation of the science introduced earlier.